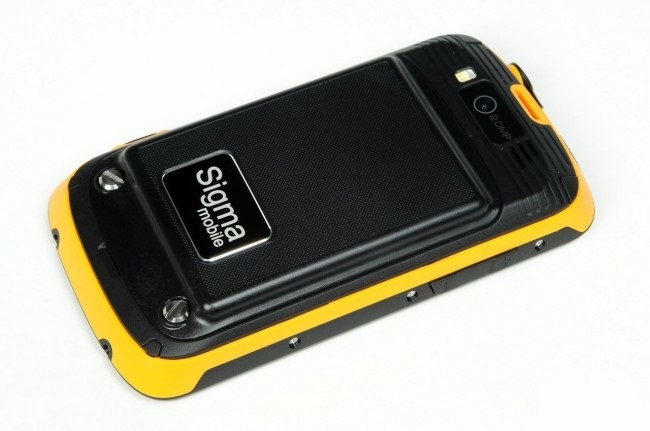 Sigma mobile X-treme PQ11 – dvuhsimny smartphone with dustproof waterproof IP67 conformity with the international standard and the price of $146. With these three components, it does not have competitors. If you need an affordable smartphone with two SIM, can withstand the harsh conditions – the choice is unambiguous. 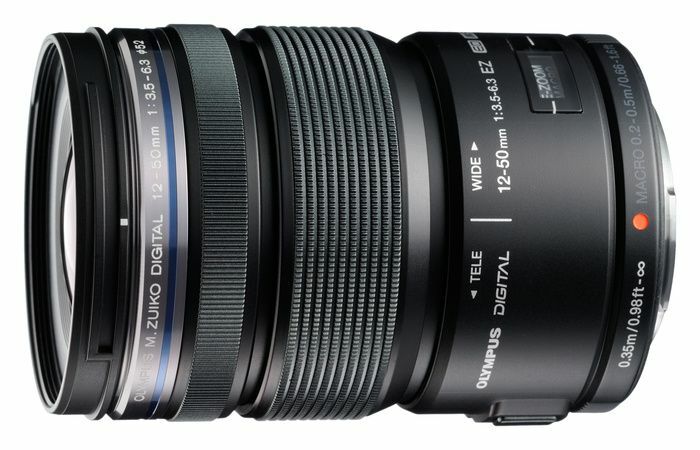 How good is the Sigma mobile X-treme PQ11 and whether it makes sense to save a few dollars, giving preference to this model, we found out for several weeks. 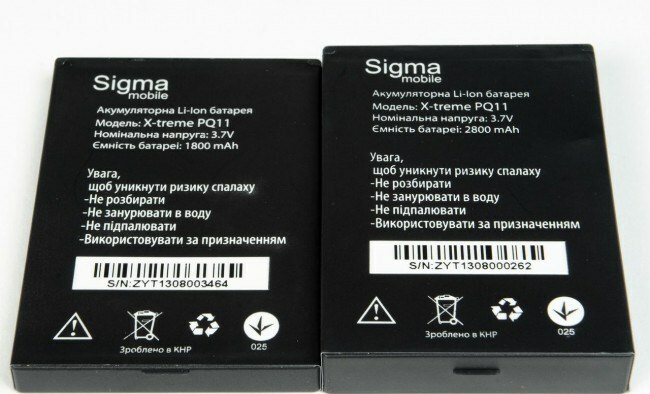 The Smartphone comes in a white cardboard box on the front side of which flaunts Sigma mobile X-treme PQ11 in the drops of water, and on the sidewalls and the back of the specifications and information on the degree of protection. 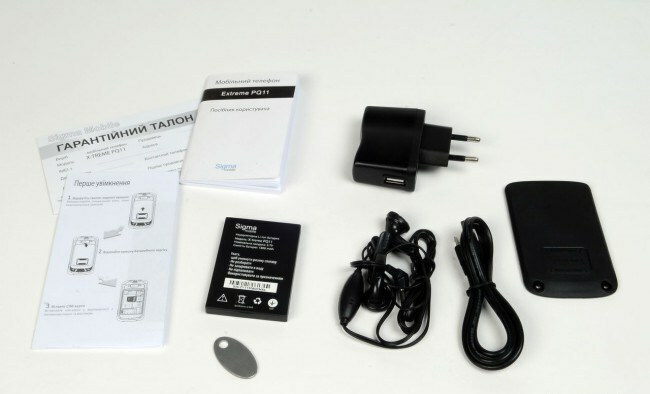 Inside the user will find: smartphone, an additional access panel under the second battery capacity of 2800 mAh, Standard battery capacity of 1,800 mAh, the clip for loosening mounting screws, USB-cable with a longer connector, AC charging adapter with a 0.5 A presence indicator Mains and stereo. In addition, complete documentation is present, consisting of a brief instruction on the first start-up and operating instructions in Ukrainian. Users should be handled carefully from USB-cable, as finding a replacement will not be easy. Any other cables are not suitable to a short connector that barely gets to the contacts on your phone, it is worth any of them are easy to move, as the connection is interrupted immediately. 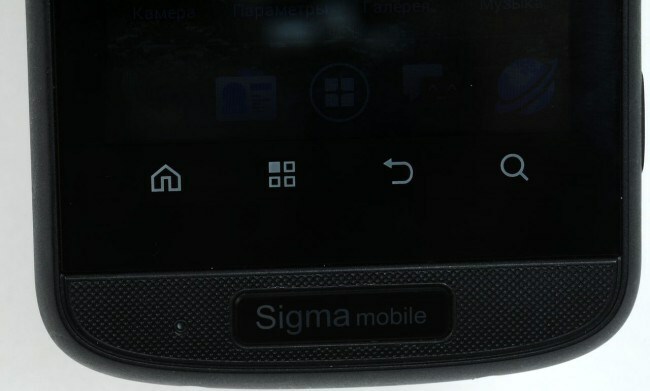 Such a feature we’ve seen in ordinary phones Sigma mobile, who visited the test earlier. 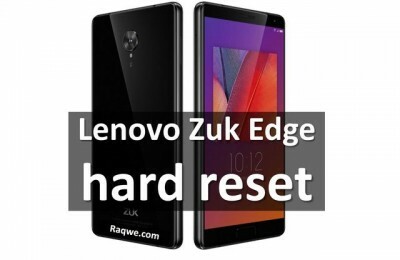 Smartphone devices like 2011: a massive, with rounded corners and four touch-sensitive control buttons below the screen. 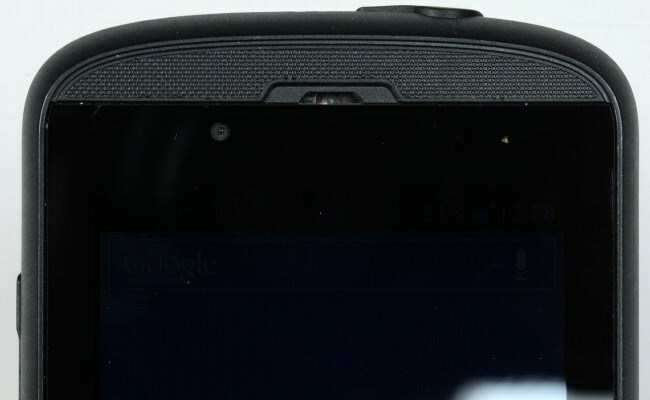 On the front panel, in its upper part, there is a VGA-camera slot just below the earpiece, light sensor and proximity sensor. 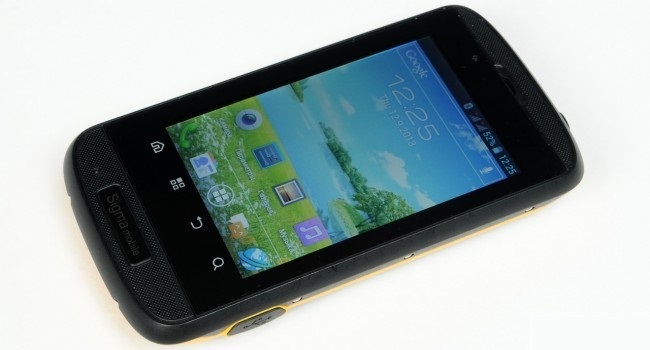 The main part is occupied by the 3.5-inch TFT-LCD with a resolution of 480×320 pixels. He and a small area around it, including the touch-sensitive keys, covered with protective glass with no oleophobic coating. The sequence of softkeys is puzzling, from left to right are: “Home”, “Context Menu”, “Back” and “Search”. It is not clear why there was no key to open the menu at the left or right. However, you can get used to this, and location, but if you use more than one Android-based smartphone, confusion is inevitable. Under the tempered glass is a plastic insert semicircular shape with a well-palpable texture. At its center on glossy insert logo emblazoned manufacturer, and to her left – opening conversational microphone. The same insert with same pattern is present on the display. Probably, these inserts have reduced the cost of the device, as the producer did not have to order the glass to the shape of the body, taking advantage of existing stocks, the missing part of the same filled with plastic. Frame in matt plastic casing encircling the perimeter, slightly above the glass front panel. In the frame has nine holes for screws. Black matte plastic border with exactly the same plastic, but yellow. On sale there is another option colors – black and green. In the latter case, not only the green portion of the sidewalls, but around the plastic inserts tempered glass. On the left side edge is the volume rocker with a slight indentation for a better definition of the “+” and “-“. Key significantly extends above the body, so find it in the blind is not difficult. 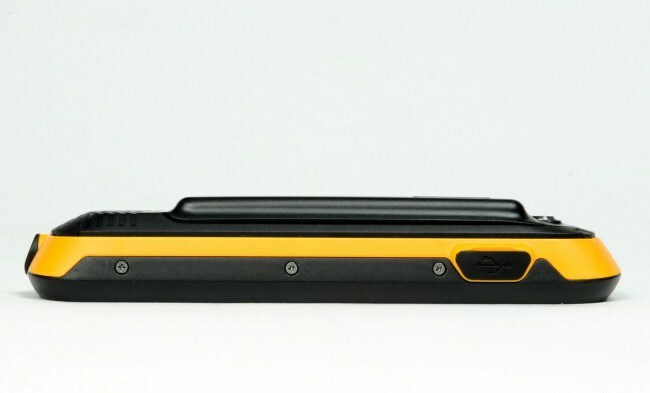 On the opposite side, at the lower end, is covered with a soft rubber plug connector Micro-USB. The durability of such caps is not in doubt. 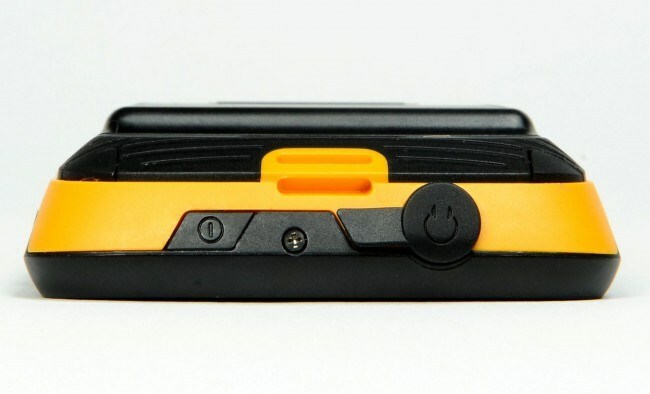 The bottom end is empty, and on the top there is a soft cap covered with a headphone jack and power button / switch, made flush with the body. Since no specific address it is not available, have to find the key at random. Next to the connector and power button located recess for the strap. 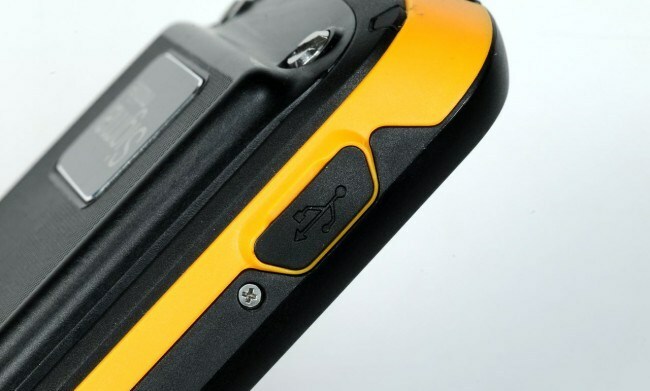 Given the class of the device, users with active lifestyles better to get a strap and fasten it in the phone. 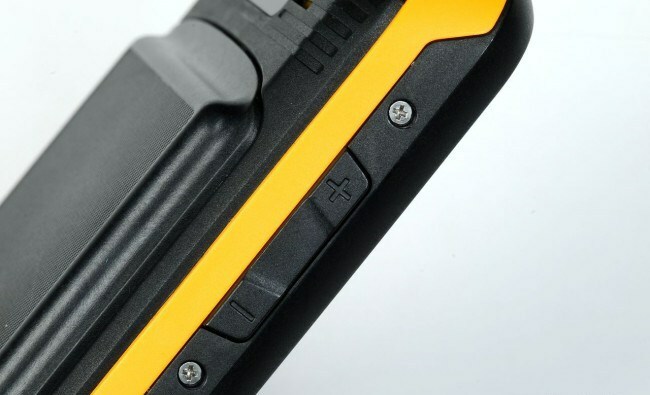 The rear part of the housing may be either planar (using standard battery) and clearly visible protrusion. In contrast to the soft gum base which carries a removable cover panel is made of the same plastic that parts above and below the display, i.e. – solid plastic textured pattern. At the bottom there is a removable cover with metal insert the manufacturer’s logo, and under it the two large screws, which can be unscrewed with a complete paper clips or coins. At the lower end there is a small notch to aid in removing the cover. Above the lens cap is 2 megapixel camera, flash and speaker. After removing the access panel, you can get up to three slots for two SIM-cards format micro and one for memory cards MicroSD. The build quality and fit of parts is high. The case gives the impression of a monolith without making scratches in any endeavor. Protective glass pressed to the screen only when a significant effort, and thus worry about is that the screen will crack if you sit on the phone, not worth it. 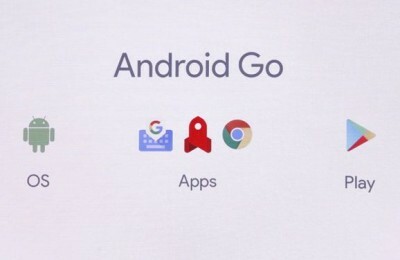 The smartphone is running Android 4.0 with an updated user interface with icons and traditional MTK-panel device notifications. 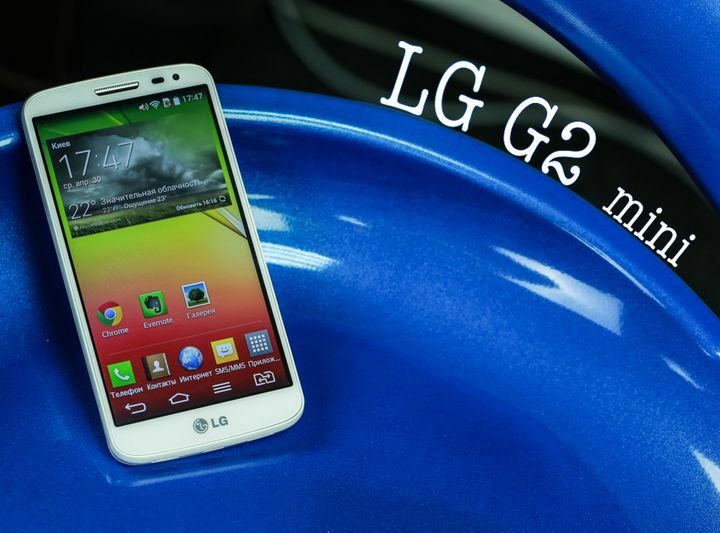 On the lock screen, you can quickly move on to the system tray, or start the camera, messages, or call the dial keypad. 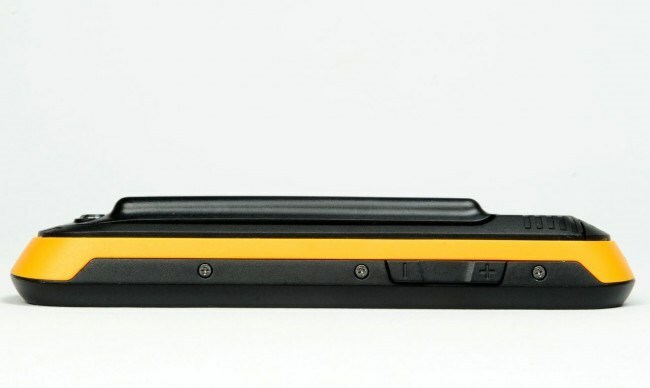 In the system tray, there are three tabs with icons include wireless modules, profiles, audio and display settings. The fourth tab is only visible if the user did not assign which of the SIM-cards will be used by default for calls and messages. Desk includes five windows located on them with widgets and application shortcuts. The bottom panel consists of four labels separated icon to open a list of applications. By pressing the shortcut menu, you can change the wallpaper, go to the settings of the application or the general device settings. Hold your finger on the open area of ​​the desktop pops up a menu with a choice of wallpaper. Holding down the “Home” opens the dispatcher running applications. 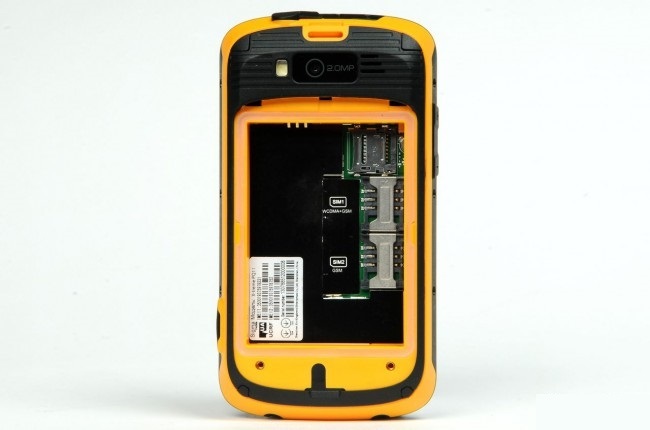 The principle of SIM-cards is exactly the same as the majority of Android-smartphone: Standby SIM both available for calls if you are taking, or by calling one of them, the other will not be available, and finally, if the first SIM used for data transmission, the second is connected. On the question of whether to expect a newer version of the operating system developer said that the update is not planned. 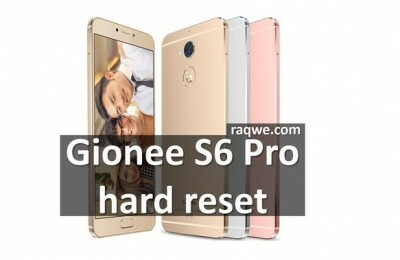 The smartphone is based on a hardware platform MediaTek MT6575M – is an updated version of the MT6575 single-chip system released in 2012. The main difference from the original is the technical process of manufacturing, 65 nm to 40 nm in favor of the MT6575. Was also reduced the frequency of the GPU PowerVR SGX531 and two reduced the amount of cache memory. The amount of RAM Sigma mobile X-treme PQ11 is 512 MB. The same amount allotted to the drive. In the settings of your smartphone, you can choose where the application will be installed to the internal memory or on a memory card. Given that the internal memory is extremely small, the presence of such a choice does not look odd. 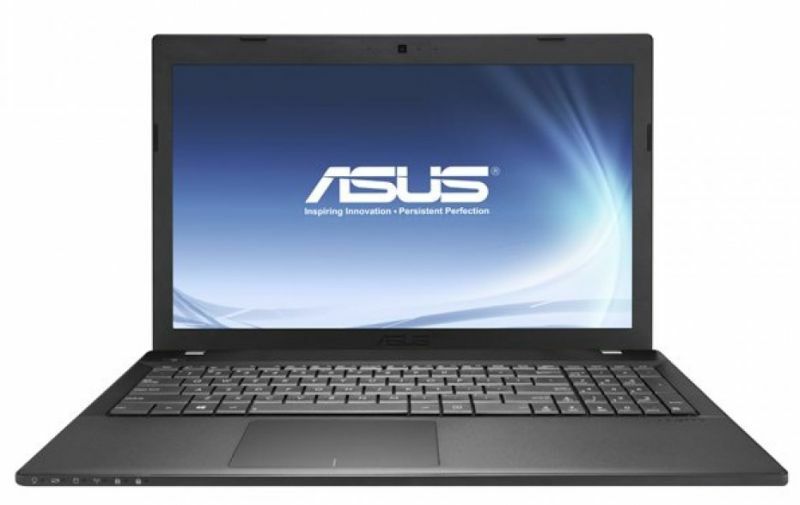 Performance system-on-a-chip MT6575M at the most unpretentious single-core solutions. 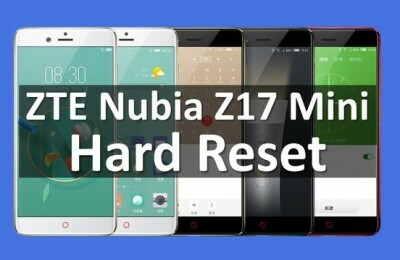 Expect from a smartphone smooth playback of HD-video is not worth it, but after installing a third-party player, able to run and see a movie with a resolution 1024h448 points, which is quite good. 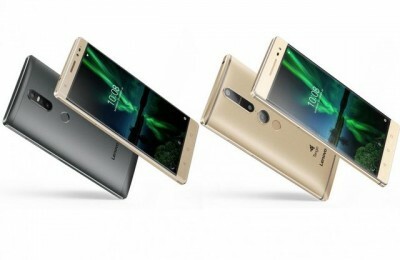 However, on a two-hour video smartphone spent 30% of the battery capacity of 2800 mA * h That’s just unlikely to find users who want to watch movies for a long time on the screen of the smartphone. 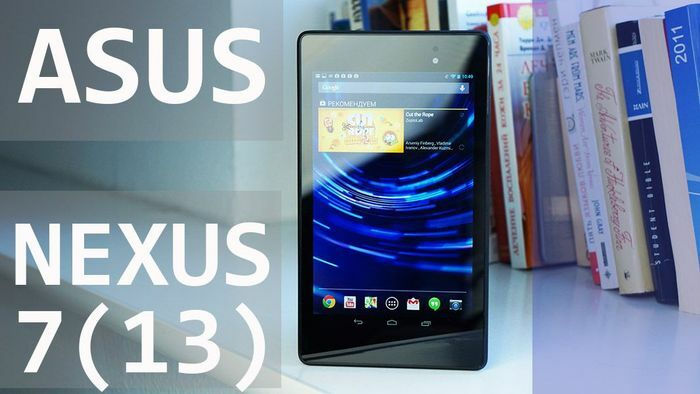 Besides being far away from the wall, it is best to save battery power and do not discharge it watching videos. We were pleased with the volume of the speakers. CALL has a very large supply volume Elementary also does not make complain about poor audibility. The sound quality of the headphones mediocre, however, unpretentious music lovers this would be sufficient. FM-radio interface does not stand out. The receiver works with headphones. In Kiev, the phone can easily find more than 30 radio stations. The sound quality, even when the room is very good. In the setting of FM-radio with RDS enable the display and record the radio. Numeric keypad dialing supports search for contacts by numbers and letters, including Cyrillic. The moments of good. With the high-capacity battery showed the following results. 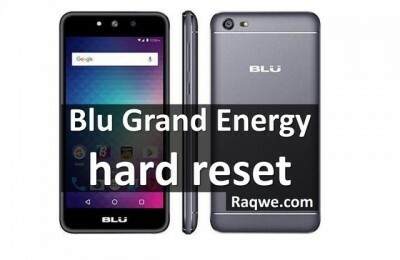 This suggests that the active data transfer synchronize two accounts, telephone conversations to 15 minutes a day, but no video or using GPS, the user can count four days of the battery 2800 mAh and two and a half days with the standard battery capacity. Surprisingly, the search for GPS-satellites takes a little more than a minute (cold start), and in that short period smartphone can find a dozen satellites. 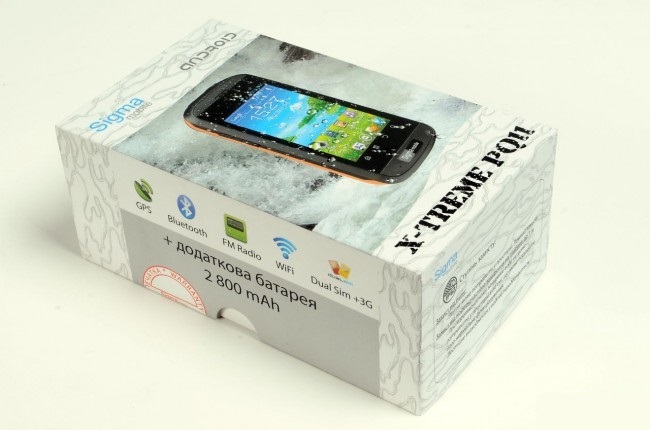 Given the manufacturer of the hardware platform, we expect to see much lower results, which could well be one of the reasons why the conscious users would refuse to buy X-treme PQ11, after being away from the creature comforts, including coverage of mobile networks, the correct and rapid determination of the coordinates can greatly help out. 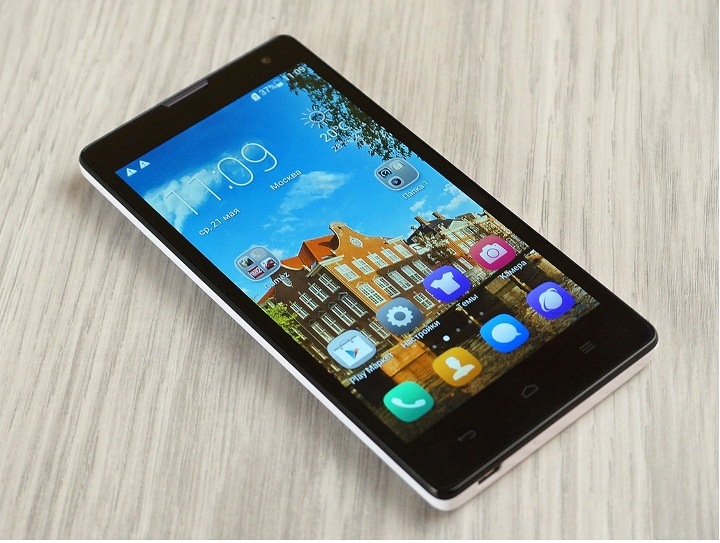 The smartphone features a 3.5-inch TFT-screen with a resolution of 480×320 pixels (165 PPI). When viewed at an angle image fades, but at a right angle the picture looks quite decent. The behavior of the screen when struck by sunlight readability remains at a good level, contributes to this relatively high maximum brightness of 455 cd / m². 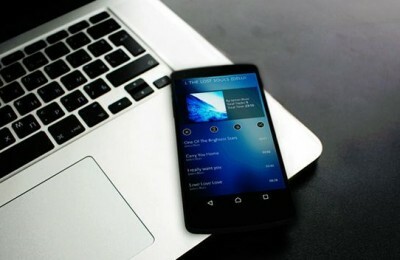 Read from the screen smartphone at night is also quite comfortable, the brightness drops to 17 cd / m ². The average value corresponds to 219 cd / m ². Recall that on an average brightness of the tests we conduct a two-hour autonomy smartphones. Smartphone screen accurately displays the dark and light areas of the image, but the white balance out strongly in cool tones, making the picture look too cold. 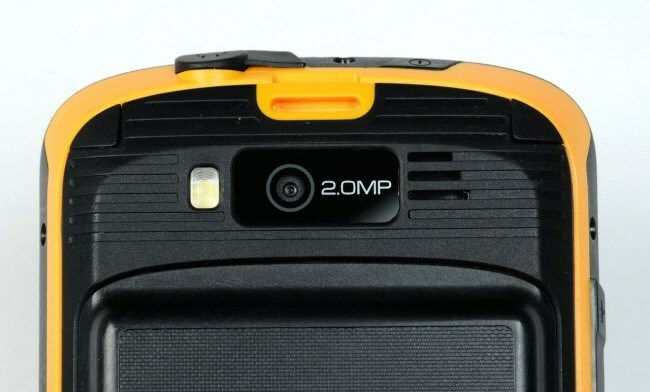 The main camera has a 2-megapixel sensor, but in the settings you can enable a resolution of 5 MP (interpolation is used). Resolution of the recorded video is 864h480 points. 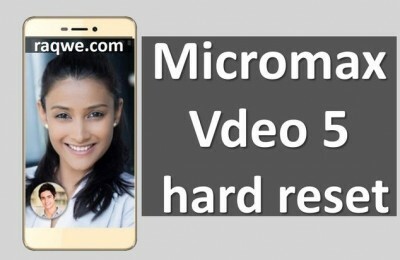 Resolution of the front camera is also modest by today’s standards – 640×480 pixels, though with its main task – video calling, she copes. Use the flash as a flashlight, you can only install a single application. 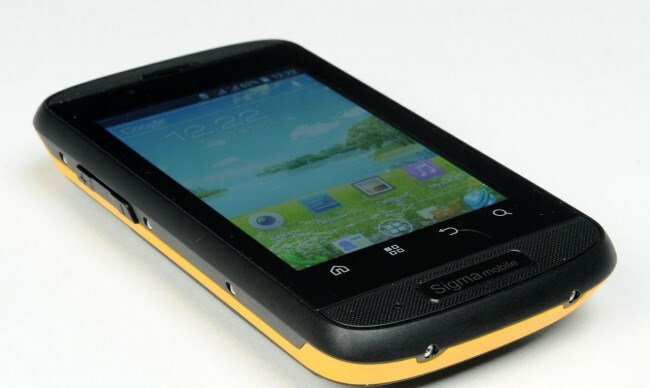 Smartphone Sigma mobile X-treme PQ11 proven to be a device that fully justifies its cost. 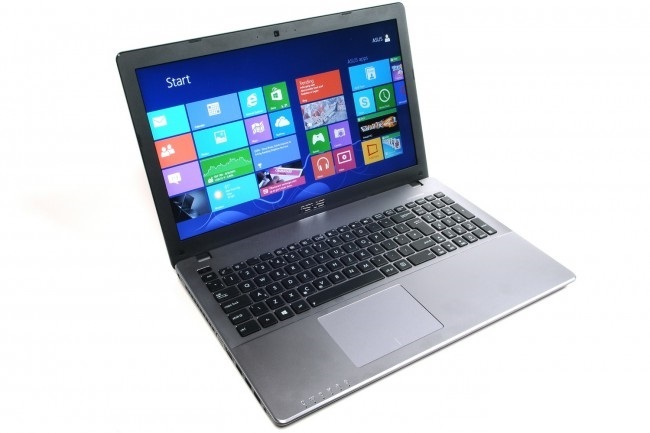 If there is a limited budget and need a long time to be away from the power supply, X-treme PQ11 is the best choice. 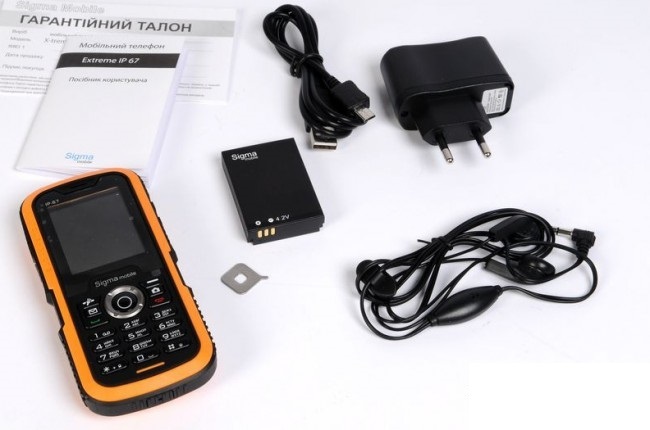 He is not only not afraid of water and dirt, but also has a loud-speaker, is able to catch the signal in areas with poor coverage and is able to quickly determine the coordinates on the GPS-satellites and all this has two slots for SIM-cards. Among the shortcomings noted the need to use the bundled USB-cable, Slow charging is not the most current hardware platform and a mediocre 2-megapixel camera.